Looking for movie tickets? 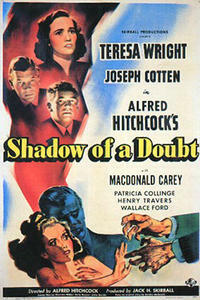 Enter your location to see which movie theaters are playing Shadow of a Doubt / Laura near you. SHADOW OF A DOUBT - What starts out as a charming portrait of idyllic small-town life gradually darkens into one of director Alfred Hitchcock’s most devastating thrillers. LAURA - Investigating a murder, chain-smoking Detective McPherson (Dana Andrews) falls in love with the dead woman - only to find out that it wasn't she who was murdered.